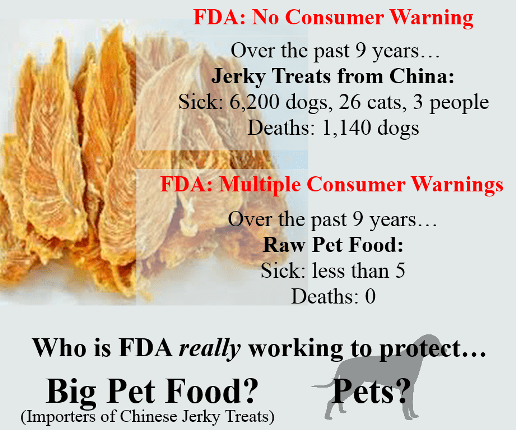 Nine years later, the FDA STILL can’t give consumers a cause to why thousands of pets have been sickened or killed by Chinese imported jerky treats. 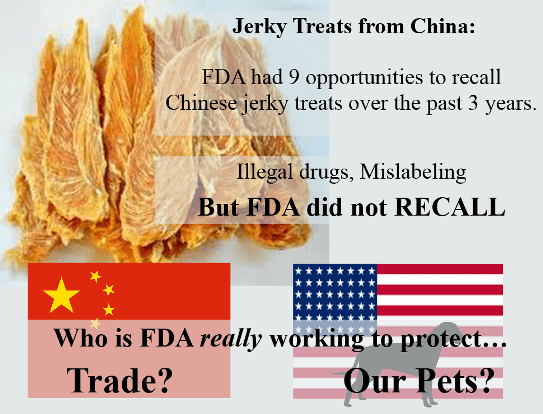 And the update tells us FDA had 9 opportunities to recall Chinese jerky treats – but did nothing. May 16, 2016 the FDA provided consumers with an “update” to their 9 year long jerky treat investigation. 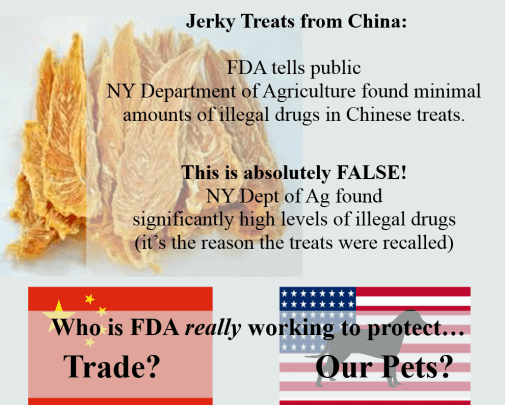 The agency told consumers their investigation is “ongoing” – meaning, the FDA still has no clue why Chinese jerky treats have killed more than “1,140 dogs” and sickened “6,200 dogs, 26 cats, three people”. This statement by FDA is absolutely not true. Drug: Sulfaquinoxyline – 29 treats tested positive, highest concentration .828 ppm. Drug: Sulfaclozine – 79 treats tested positive, highest concentration was 1.598 ppm. Drug: Tilmicosin – 31 treats tested positive, highest concentration was 0.528 ppm. Another document provided by FDA in this recent update is titled Jerky Pet Treat Investigation Testing Rationale and Results for October 1, 2013 – December 31, 2015. In this document we learn of 9 different instances where FDA could have initiated a jerky treat product recall, but didn’t. Page 5: “Several bacterial enterotoxins can cause severe illness in humans and animals. Product irradiation reduces the chance of bacterial growth after packaging. However, if bacteria produced toxins prior to irradiation, the toxins could potentially survive irradiation and be present in the final product. Two products tested positive for dangerous enterotoxins – No Recall. 10 products tested were mislabeled; mislabeled pet products are a violation of law, but – No Recall. 14 product samples were mislabeled; mislabeled pet treats are a violation of law, but – No Recall. 11 samples were mislabeled; mislabeled pet treats are a violation of law, but – No Recall. 13 samples over two years were mislabeled – No Recall. 43 samples tested positive for illegal drugs over 2 years – No Recall. 6 samples tested positive for an unapproved food additive – No Recall. 7 samples tested positive for an illegal drug – No Recall. 1 product tested positive for an illegal drug – No Recall. I’ve yet to meet a pet owner that believes FDA ‘strives to make sure pet food products are safe’. This news is plain sickening!! China owns us we are their cash cow! That is who FDA is protecting not us or our innocent pets! What is this country coming to? God help us all ! Just stop buying anything from China. Save our pets. things will only get worse with the “new” TPP agreement which will bypass what existing protections we have now in favor of “free” trade. I can’t hardly read this it upsets me! Our Government, including the FDA is in the back pockets of China and big companies, just to name a few. We are human guinea pigs and our pets are also experimental in the plan too. Just makes me so MAD! Just more evidence of the total waste of trillions of dollars every year on a government that is nothing but a millstone around our necks – USELESS!!! A few months ago I asked FDA/CVM if they had tested the suspect items for endotoxins, not surprisingly they did not respond. We have to wonder how complete their investigation has been into this calamity. They should first eliminate all of the potential causes, which they obviously have not done. I question the integrity of their staff if they can have a problem go unresolved for so many years without a hint of a solution. Do they really care or is this just another case of “SO WHAT” as we are seeing repeatedly from FDA when it comes to the safety of products being fed to our pets. The FDA is a SHAMEFUL & CORRUPT Gov’t agency, who must think that we are ALL brain-dead by now, from all the fluoride they keep poisoning our water with. 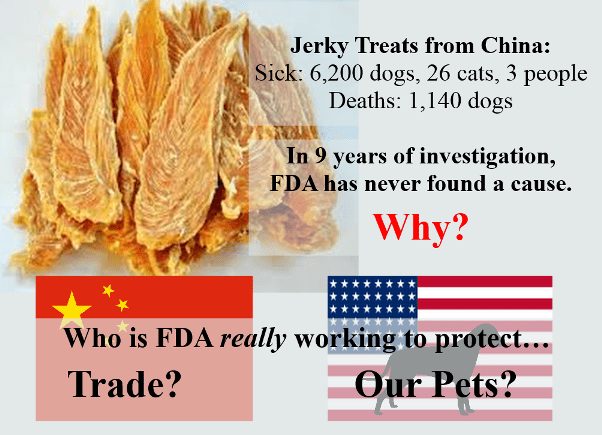 How in the world can they think that looking at the MOUNDS of evidence of what Chinese jerky treats has done to our beloved pets, that they should have recalled them 9yrs ago! What audacity they have to patronize us all, that we would be so stupid enough to believe their lies! Now they have the further audacity to continue lying to the public and wasting a tremendous amount of tax payer dollars on their “witch hunt” against raw food manufacturers! All the evidence of toxic food ingredients points in the direction of the big pet feed manufacturer’s, yet they keep re-directing their scrutiny in the wrong direction! This is UNBELIEVABLE that they somehow continually get away with this!, all at the expense of innocent animals lives lost, or their health badly injured. When is an FDA investigation going to happen?! They blatantly ignore facts, the law and seemingly do as they wish, or as the big corporations dictate to them. It’s infuriating to say the least! The FDA has had a serious corrupt reputation for many years. It’s own scientists have acknowledged being intimated and threatened. Our gov’t goes after its whistleblowers reporting on crimes, rather than the criminals themselves! I hate to be such a pessimist and am not advocating resignation, but the odds are tough. The latest Obama nominee and chosen Chief of the FDA, Dr. Robert Califf (replacing Dr. Hamburg, who is being sued in federal court for homicide, conspiracy, racketeering, bribery), has major long-term connections with Big Pharma (lucrative dealings, financial support from more than 20 companies, millions in funding while at Duke Univ.). He is the “ultimate industry insider” (per Harvard political science professor, Daniel Carpenter), has deeper ties to the pharmaceutical industry than any FDA commissioner in recent memory (NYT) and was voted for almost unanimously (89 to 4) despite the many obvious conflicts of interest. Big Pharma has, now, solidified its control of the one of the top 3 most powerful and dangerous U.S. gov’t agencies (along with the USDA)! Government corruption is rampant. The best ways to deal with them is through persistence, public information/education and laws suits. Trusting them and expecting integrity will rarely, if ever, happen, if ANY money and power is involved! I believe there are a FEW honest senators. 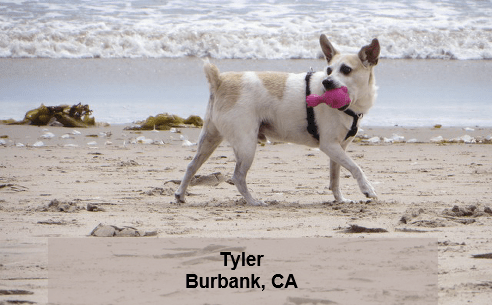 If they have beloved pets, and/or are animal lovers, they may be reached. As evidenced by their voting records and general ideology, most of them, most likely, will be progressive members of the democratic party. I don’t know about all chicken having the Arsenic. I do know Organic does not and chicken puchased from a farmer would not. You can Google it to read about it. To Sheri : as Terri says – best to buy organic, and also good to know your farmer. If they are not in your area, can google them. Also, the “Certified Organic” label is best, as is strictly regulated. The term “Free-range” is controversial and often is green-washed, but can be done honorably.